Ginger barbecue brisket sandwich at Num Pang Kitchen in the Prudential Center. There’s a kind of flow that happens when you queue up at Num Pang Kitchen. Customers approach and look up from their phones, scrutinizing the gleaming menu boards above the counter, arms crossed or hands on hips. They fall in line, and so do you, pondering whether to order a sandwich, a salad, or a grain bowl. Best not to dawdle. A crowd is forming behind you. 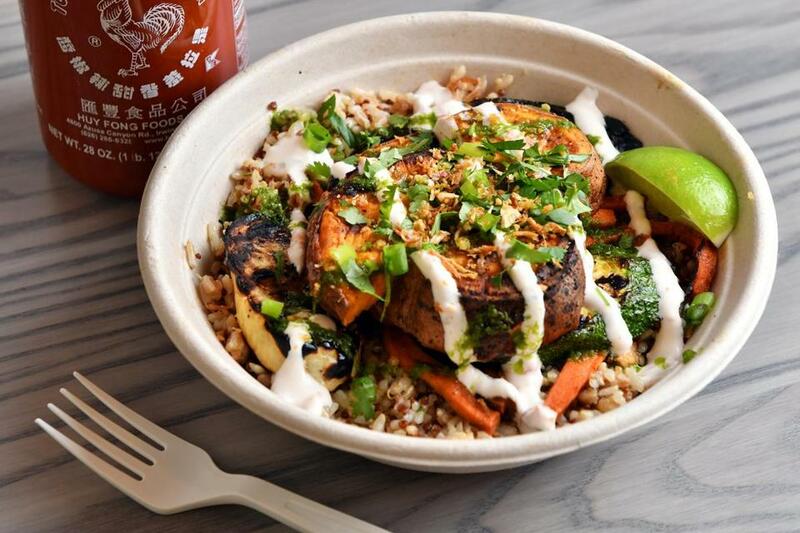 Open since May on the retail level of the Prudential Center, the fast-casual eatery is the Boston outpost of a New York chain with seven locations in Manhattan. Like Wagamama directly across from it, and Eataly down the corridor, there is always a line — but it moves fast. That speed is part of a winning formula, explains chef and cofounder Ben Daitz. “The city is embracing things that are in our wheelhouse,” he says, referring to the restaurant’s Southeast Asian flavors, packaged up for guests on the go. “Num pang” translates as “Cambodian sandwich.” The version with ginger barbecue brisket ($9.75) is a delicious example of the signature item. Thick slices of braised beef (just lightly gingery) are tucked inside a chile mayo-slathered baguette, topped with cilantro, cucumber, and julienned carrot. It reminds you of a saucier version of Vietnamese banh mi. Choose from an array of fillings, including skirt steak, coconut shrimp, or roasted cauliflower. You can upgrade to quinoa bread, which sports a grainy texture, for 50 cents more. Unlike other quick-serve spots where you shuffle along in a cafeteria line and tell staff how to customize your dish, most items here are set. The most complicated choice you’ll face involves the grain bowl, where you select from brown rice, jasmine rice, or a “super grain” blend. That mixture of brown rice, farro, and two kinds of quinoa — seasoned with a squeeze of lime juice — is the most interesting. It serves as an appetizing bed for roasted seasonal vegetables ($10.25) like sweet potato, asparagus, and lightly charred onion. Another bowl with pork belly ($11.75) is fine, although the advertised five-spice seasoning is hard to detect. All bowls come drizzled with a zippy chile yogurt sauce (a soy yogurt version is also available) and an emerald green slurry resembling chimichurri spiked with fish sauce. The fare here is appetizing when the team gets it right, but a bit of a hot mess when it does not. Take for example the grilled corn with coconut and lime ($3.75). A full cob arrives in a flimsy foil wrapper, doused so liberally with an aioli-like concoction that it’s difficult to eat, no matter how many napkins you drape on your lap. Citrus and coconut flavors lose their way in the sauce. The format might be the reason no one in this collared-shirt-and-twinset-sweater crowd has the dish in front of them. Then there are the rookie mistakes. The fillet in a peppercorn catfish salad ($10.75) has languished hours too long in an overly sweet marinade, and the romaine lettuce beneath has turned brown at the edges. A speedy turnaround is admirable, but so is attention to detail. Some fine-tuning is needed here. Purists, of course, will insist that this isn’t Cambodian cuisine. It’s true. You would be hard pressed to find a raw kale-apple salad at a Phnom Penh night market. Still, this loose interpretation of Southeast Asian flavors is a welcome detour from the usual burger and fries. Some sides in particular shine. 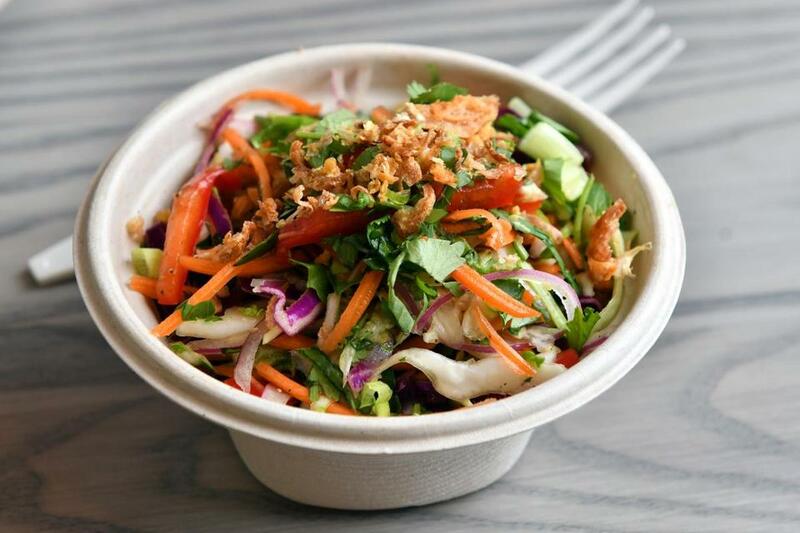 Cambodian slaw ($3.95) is terrific, showcasing a mix of red and green cabbage, Thai basil, and frizzled shallots, all dressed in a refreshingly tart dressing. On the other end of the spectrum is a condensed milk-laden Cambodian iced coffee ($4.95). It offers a sweet, caffeinated jolt — perfect fuel for your rush back to the office. Major credit cards accepted except Discover. Wheelchair accessible. Prices Sandwiches $7.95-$11.95. Salads and grain bowls $10.25-$13.75. Soups and sides $2.95-$5.95. Beverages $2-$4.95. 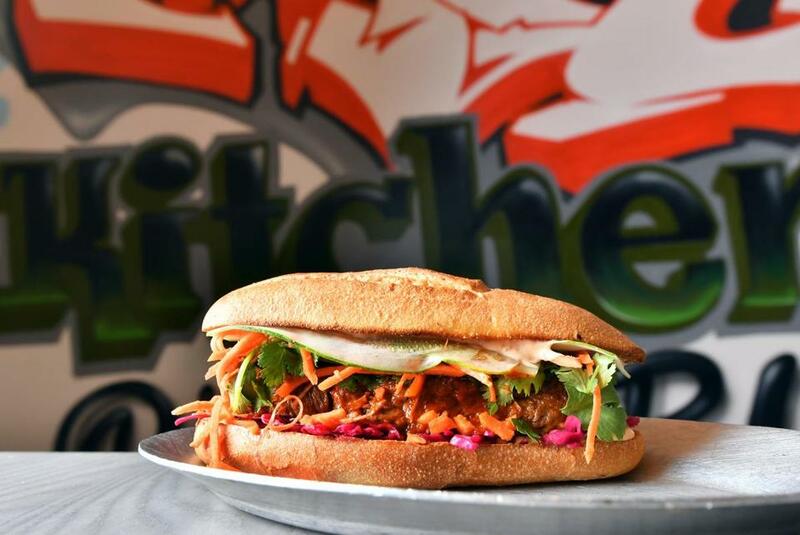 Hours Daily 11 a.m.-9 p.m.
What to order Ginger barbecue brisket sandwich, roasted seasonal vegetables on “super grain” blend, Cambodian slaw, Cambodian iced coffee.